Home » Piano Notes » How to Read Piano Notes Welcome back! today I will show you how to read notes with rests. Let's first make a summery of what we've learned so far. When talking about rhythm we divide the beats in the music to groups. Each group gets a barline. so if we have a time signature of 4/4 we get a bar line after every four beats. In thoses groups we play tones with different lengths. We can measure the length of those tones according to the beats. "Music and silence combine strongly because music is done with silence, and silence is full of music. ~Marcel Marceau ". Now, When the beats move on and on it will be tireding to hear sounds all the time. further more it will be rather crowded and boring after a while. Leopold Stokowski actually said that "a painter paints pictures on canvas, but musicians paint their pictures on silence." What I like about this saying is that you play the silence. You understand that it give a beautiful contrast to the sound. So What's the meaning of rests? A rest is a sign of silence. So today I will show you three different rests that have three different lengths. When you see a rest you have to reconize how long it is and then to skip those number of beats. this will become clear to you as you procceed reading. In the next example you can hear how I play this rest in a musical pattern. 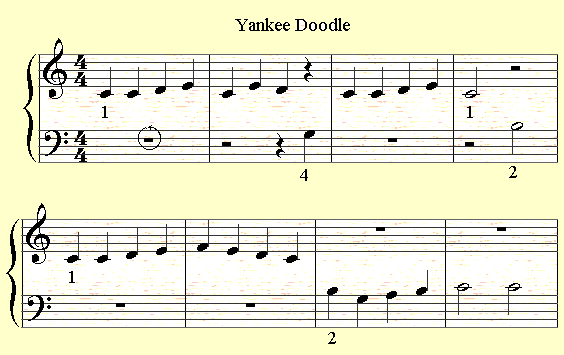 In this example the second beat and the fourth one should remain silent in the second bar. Or maybe better say should be played silently. Your browser does not support the audio tag. But how to read piano notes rests of half note and a whole note? Here is how the sign of a half note looks like. Let's see how we combine them in a musical pattern. this time try for youself maybe and then listen to the answer. From now on when the left hand is not participating in playing a sign of rest will appear in its staff, same with the right hand. Notice than when a break of a whole bar should be made you'll the same sign, whether a musical piece is in three or four quarter. O.k., by now you're ready to try the next pieces. They will help you to understand this subject fully. In order to take the next step in reading piano notes you should definately check out the Rocket Piano Ultimate Learning kit. Rocket Piano provides an amazingly handy and effecive piano course on various issues such as reading piano notes, playing piano by chords, piano technique and more.